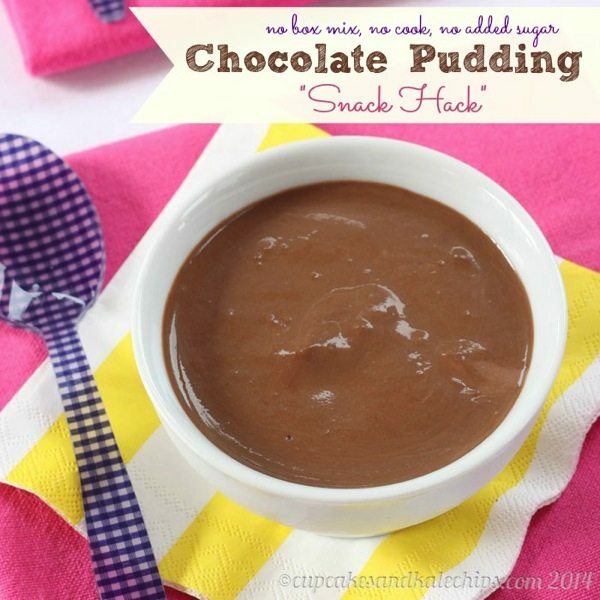 When your kids are clamoring for a sweet treat, but you want to give them something healthy, forget the box mixes, no need to cook, just blend together a few basic ingredients for a last minute dessert with this Chocolate Pudding “Snack Hack”. 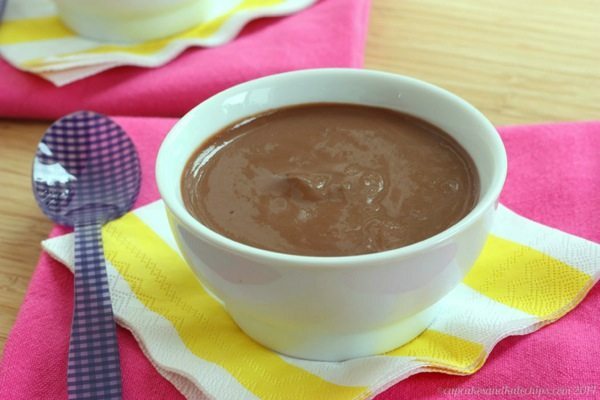 This chocolate pudding will have you grabbing a spoon for yourself and the best part is that it is a healthy snack with no sugar added! My fellow food bloggers may gang up on me for this, but I am going to come clean – meals and snacks and desserts aren’t always the way they appear in the photos on our blogs. Especially for me right now, as we are preparing to sell our house and looking for a new house for an out of state move, my husband is working out of state during the week, and I’m on my own trying to keep up with a blog, a house that is in the process of being cleaned, packed and prepped for selling, and of course my two boys. I would like to pretend that everyday starts with Strawberry Cheesecake French Toast Roll-ups, lunch is an Apple & Blue Cheese Chicken Salad Sandwich with veggies Greek Yogurt Pantry Ranch Dip, Waldorf Fruit Salad comes out for rumbly tummies in the afternoon, and the World’s Best Lasagna is dinner, followed by Monster Snickers Pie for dessert. Let’s keep it real, though – these days it’s usually yogurt for breakfast, school provides the snacks, whatever I pull together becomes lunch (though I don’t do half bad there, if you watch my Instagram), and hotdogs and frozen veggies or scrambled eggs and fruit or just leftovers for dinner. But just because I’m pressed for time (and sanity) doesn’t mean I don’t want to give my kids snacks that are fun, tasty, and healthy. Of course fruit makes a regular appearance in my boys’ snack bowls, but as good as that is, it does get a little boring. So that’s where my “snack hacks” come in. Sometimes it’s “Whatever’s in the Pantry Trail Mix”, or I’ll make “Apple Donuts” where I sandwich peanut butter or cream cheese between apple rings. My four-year-old loves dates wrapped around a string cheese that I’ve cut into thirds, and the one year old, well, let’s face it, as long as it’s edible, he’s a happy camper. While I certainly do keep convenience foods on hand, like applesauce pouches, fruit chips, and crackers, I don’t often tend to pick up pudding cups or mix. 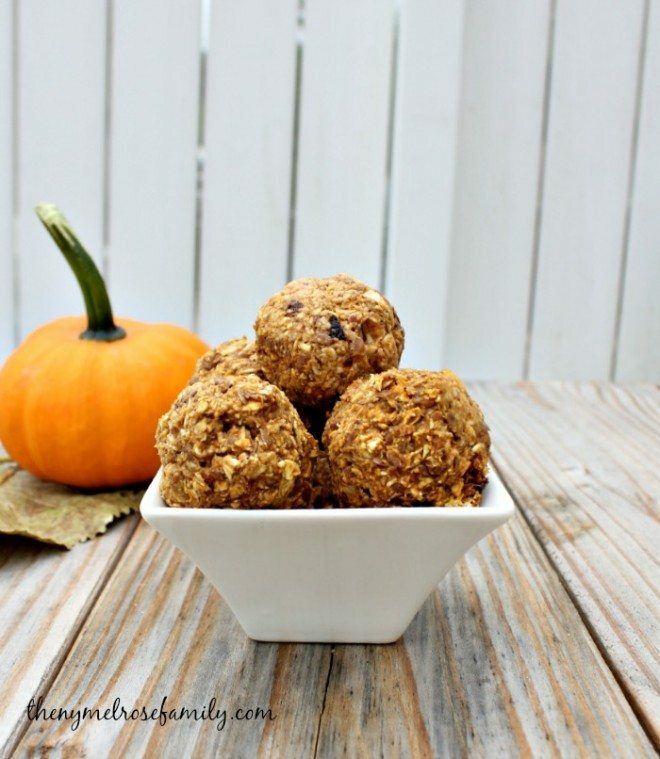 But sometimes I want throw together last minute special treat for my boys. Well, my healthy version of chocolate pudding has definitely become one of their favorite desserts. It’s literally a banana, Greek yogurt, and cocoa powder. If you don’t have allergies in the house and have a PB-lover like I do, you can also stir in a little peanut butter for a little more protein and an extra pop of flavor. Make sure you use some nice, gnarly, overripe bananas so that they are super-sweet, and you won’t even have to add any extra sugar or honey or anything else to sweeten it up. And while you can serve it immediately, if you make it earlier in the day, it’ll thicken back up just a bit to be closer to typical chocolate pudding consistency. I hope you and your kids love bowl of creamy, chocolaty goodness as much as we do! 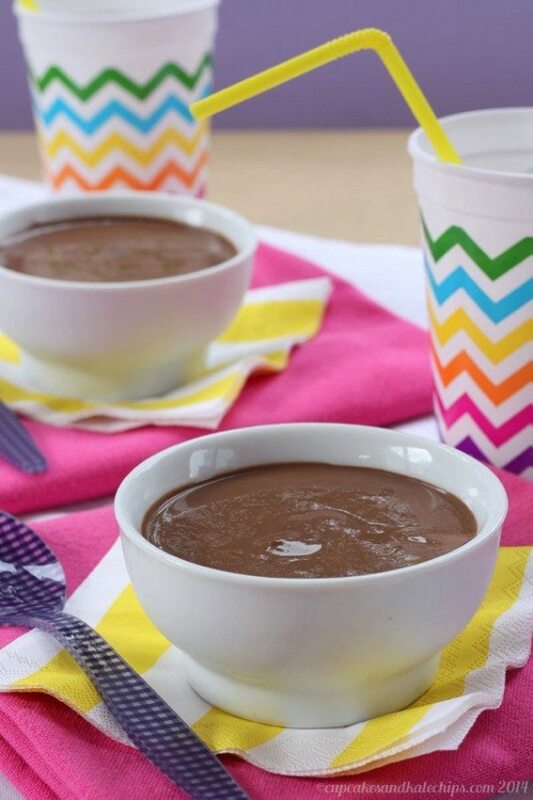 A healthier version of the fan favorite chocolate pudding. Combine all of the ingredients in a mini food processor or blender and blend until smooth. Alternatively, you can mash up the banana with a fork, and stir everything together, but the pudding won’t be quite as smooth. Divide between two bowls and refrigerate until ready to serve. Can be served right away, but it will firm up a bit if you refrigerate for at least an hour. This looks SO good! I feel for you with the busyness of moving — we moved this summer and are still in limbo as we search for our next house. All this craziness will be worth it in the end 🙂 Thanks for sharing this yummy recipe. I made this and was very disappointed. It was quite bitter, despite my using sweetened vanilla yoghurt in lieu of the Greek yoghurt. It was also quite runny despite sitting in the fridge for a couple of hours. Is there supposed to be sugar? Or flavored yogurt? This was not edible. Disappointing. Did you mean to make it with 2 tsp of cocoa powder or something like that? It didn’t come out right at all. This is not good at all. Way too bitter. 1. You’re palate is used to overly sweet food. 2. You’re banana wasn’t very ripe, as the recipe calls for. My banana wasn’t very ripe, so I added just a touch of honey. I didn’t add much at all. It wasn’t super sweet, but I find it delicious. I wish I’d read the comments before I made this because I totally agree, it was far too bitter. Definitely reduce the amount of cocoa and it might be alright. I realize yyour stress, systems that are existing work with a variation iin skin ccolor and haircolor. Around the evening of our event, the limo appeared particularly by the due date with the most friendly driver. This was delicious! I just mashed the banana (a very ripe one) and mixed it all up. My TB measuring spoon was buried in the sink so I used 2 heaping tsp,which maybe was a good thing after reading all of the comments. It was “firm” and very tasty with strawberries to dip in it. Oops, that was supposed to be 4/5 stars. I wish I would’ve read the comments first. This was extremely bitter and gave me the “gross shivers “. Our palate is actually very sensitive to sugary sweets as we try to avoid added sugar in general so that was definitely not the issue and my banana was beyond ripe. The ratio is totally off. I wound up saving it by adding a couple tsp of maple syrup. Like the concept but will have to experiment to get it right.